“Revision of Recalled Modular Neck Rejuvenate and ABG Femoral Implants”. Christopher P. Walsh, MDa, James C. Hubbard, BSb, Joseph P.Nessler, MDc, David C. Markel, MDa,d, The Journal of Arthroplasty 30 (2015) 822–826. “MRI Findings Associated with Recalled Modular Femoral Neck Implants”. Michigan Orthopedic Society Meeting, 2015. Christopher P. Walsh, MD1; James Hubbard, BS2; Joseph Nessler, MD3; and David C. Markel, MD1,4. Letter to the Editor: In Response to “Modular Taper Junction Corrosion and Failure: How to Approach a Recalled Total Hip Arthroplasty Implant”. Davies JF, Leone WA, Nessler JP, Perona PG J Arthroplasty. 2014 Feb;29(2):449-50. “Surgical Management of Hip Arthritis”; Chapter 15: The Dual Incision Approach, Saunders 2009. D’Antonio, Morrish, and Nessler J. Mid-Term Results of an Arc-Deposited HA Coated Acetabular Prosthesis. Bulletin NYU Hospital for Joint Diseases, March 2008. “Minimally Invasive Total Joint Arthroplasty”; Chapter: Anterior Double Incision Lateral Decubitus Position, Springer, 2004. Nessler JP and Mass DP; Direct Current Electrical Stimulation of Tendon Healing in Vitro. Clin Orthop 217:303-312, 1987. Nessler JP: Healing of Canine Tendon in Zones Subjected to Different Mechanical Forces: A Biomechanical and Histological Analysis. Journal of Hand Surgery (British Vol) 17B:561-568, 1992. Nessler JP, Cofield RH, Weinstabl R: Diagnosis of Shoulder Instability by Examination Under Anesthesia Clinical Orthopaedics 291:45-53, 1993. Nessler JP and Mass DP: “Direct Current Electrical Stimulation of Tendon Healing in Vitro”. Presented at the 31st Annual Meeting of the Orthopedic Research Society, 1985. Presented also at the 40th Annual Meeting of the American Society for Surgery of the Hand, 1985. Nessler JP, Amadio PC, Berglund L, An KN: “Healing of Canine Tendon in Zones Subjected to Different Mechanical Forces: A Biomechanical and Histological Analysis”. Presented at the 36th Annual meeting of the Orthopaedic Research Society, 1990. Nessler JP, Cofield RH: “The Diagnosis of Shoulder Instability by Examination under Anesthesia”. Presented at the 7th open meeting of the American Shoulder and Elbow Surgeons, 1991. Nessler JP: “Minimally Invasive Total Hip Replacement”. State of the Art in Orthopedics. Snow Bird, UT; February 8-9, 2003. Nessler JP: “Maximizing Range of Motion and Stability in Hip Replacement”. Snow Bird, UT; February 8-9, 2003. 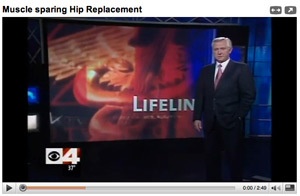 Nessler JP: MIS Hip Replacement. Live Surgery Symposium. Beth Israel Hospital, New York. May 14, 2004. Nessler JP: Knee Ligament Balancing in Total Knee Replacement. Live Surgery Symposium. Beth Israel Hospital, New York. May 14, 2004.